As chilly as it is on the North Shore these days, rest assured it is much colder in Winnipeg, Manitoba. Or soon will be. "It's not bad right now, about 20 degrees," said Cory Schneider. "But it was 14 yesterday, so it's getting down there." "I saw it in my car last year, it was minus 22, and that doesn't factor in the wind chill," he said. But it doesn't matter how cold it gets outside. The Marblehead native and former star hockey goaltender for Boston College is the hottest thing on the plains of central Canada. Schneider, Vancouver's first-round (26th overall) draft pick in 2004, has won his last nine games, posting a sparkling .948 save percentage and a league-best 1.30 goals-against average for the Canucks' American Hockey League affiliate, the Manitoba Moose. Considered the Canucks' goaltender of the future (and the best goalie prospect from Massachusetts since Winthrop's Rick DiPietro, who has played for the New York Islanders since 2000), Schneider keeps reminding folks in Vancouver that they have a polished diamond in the system. "I see him as our number one goalie," said Stan Smyl, the senior advisor to Canucks general manager Mike Gillis. "When that plays out, we don't have those sort of answers. But right now, he's fine-tuning himself and when he gets the opportunity, he's going to push whoever is in front of him. That's how Cory approaches every game this year." While Schneider's focus is winning games for the Moose, tied for second in the AHL's Western Conference after 15 games, the Phillips Andover product knows his opportunity isn't far away. The Canucks' starting goaltender Roberto Luongo, a three-time All-Star and current team captain, has a year remaining on a four-year, $27 million deal he signed in 2006. He could opt to sign elsewhere in 2010, creating a spot for Schneider. Barring injury that would force his call-up, the 22-year-old Schneider could take over as Luongo's backup next year if upcoming free agent Curtis Sanford elects not to re-sign with the team. Schneider said he knows that for better or worse, his fortunes hinge on whether or not Luongo stays. "The only thing I can control is how well I play, and then they'll have to make a decision. If I'm doing terribly, it's pretty obvious that I'm not going to factor in their decision - they're just going to keep him," he said. "As long as I'm playing well, it gives them something to think about. That's all I can control, so that's all I worry about." The 6-foot-2-inch Schneider, a butterfly-style keeper, has great athleticism and poise to go along with superb positioning. His weaker areas - puck handling and rebound control - have improved from his college days. Right now, he needs only to prove he can stop NHL-level shooters. "If I do happen to be called up because something happens, it's going to be a really exciting day and I probably won't even know what to think, despite the fact it could be for a day or two, who knows. I talk to guys who have been called up and it seems like a real whirlwind," he said. Last year, he played poorly in the first half of the season, never more so than on Dec. 14, 2007, when Manitoba coach Scott Arniel pulled him from a game against Lake Erie after he allowed three goals on nine shots. The next day, Arniel told him words he hadn't heard before: "You're all screwed up right now." 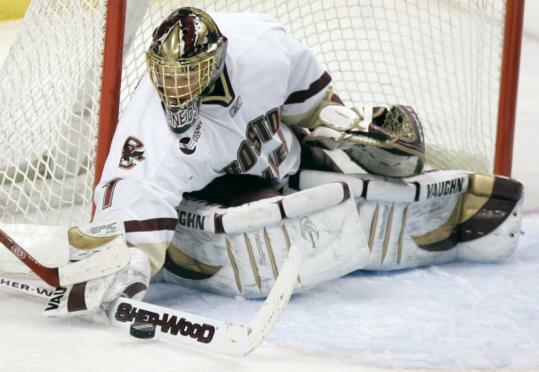 Schneider had succeeded at every turn, from Marblehead Youth Hockey to The Heights at BC. Now, his coach was telling him he would sit if his poor play continued. "You think that since you had success at one level, it's automatically going to translate to the next level," he said. "That's kind of how it's been throughout my whole career. But I think this jump was more than I thought it would be. I just went about my business as I had in college, and didn't make a whole lot of changes. I figured it worked so far, so don't try to tinker with it." "It became pretty obvious pretty quickly," he said. "You can't blow off practice as not that important, because here, every practice is important. You have to work hard and stay focused, because that's how you get ready for the game. It happens a lot with young goalies. Once I started thinking like a professional hockey player, and not like a college student who does it for fun and goes to class, that's where it carried into the season." But Schneider's subsequent play put his struggles in the rearview mirror. After going 3-7-0 with a 3.69 goals-against average in December 2007, Schneider grabbed the number one spot from veteran Drew MacIntryre and led the Moose to the playoffs, where they fell to Syracuse in a grueling six-game series. Schneider finished 18-5-2 with a 1.72 goals-against average and .926 save percentage. Though he wants to be in the NHL, he's settled nicely into Winnipeg. He's had the same two roommates, defenseman Zack FitzGerald and winger Alex Bolduc, for more than a year, and they usually keep it low-key after practice, cooking meals at their South Winnipeg condo and playing NHL 09 on XBOX 360 online. The Marblehead kid is getting used to that frigid Winnipeg climate, even if his parents might not be. Susan and Richard Schneider wanted to inspect his quarters last winter, so they took a road trip to Manitoba. "They experienced the coldest weather Winnipeg had to offer," said Schneider. After making the 1,861-mile trek, they gave their son's situation the OK.
"My mom likes to know where I'm living," said Schneider. "She has to visualize my habitat." Hopefully Mrs. Schneider can see her son plying his trade near the mild waters off Vancouver. After all, the weather's much nicer there.